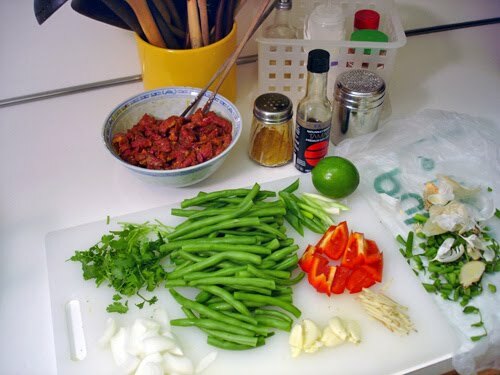 Join me to celebrate Asian Pacific American Heritage month and cook up a simple Wok Curry Beef! I put my Asian seasonings in cute dispensers organized inside my caddy basket. Put your curry powder in a cheese shaker so it’s easy to sprinkle! Instead of bouncing round the kitchen looking for this and that, I take out ONE item from the fridge. TIP 2: SAVE TIME and keeps counter tidy. Trap grocery bag under chopping board and flip trimmings onto it, wrap up and throw in trash – EASY! I use mine to parboil my beans, it’s the perfect shape and size. 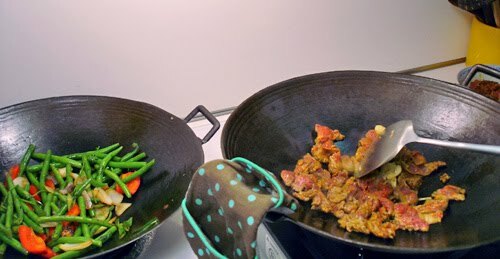 I just dry it out after using with water and the minute you start frying in it, its natural non-stick surface will build back up! An electric stove shouldn’t prevent you from wok cooking! NO, NO. 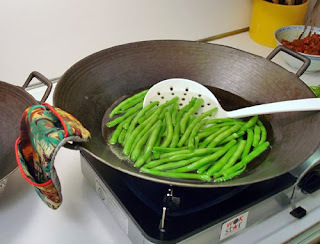 I set my cast iron wok and my portable butane gas stove right on top of my electric coil stove. I leave this setup out at all times so it’s convenient. If you don’t see it, you won’t use it. 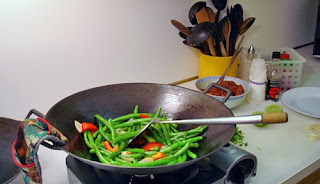 Use your wok not just for Asian stir frys but everything. TIP 5: SUBSTITUTE if you don’t have an ingredient! 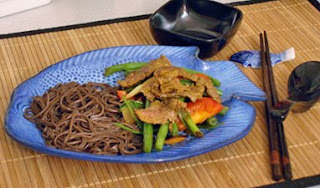 Wok Stars aren’t afraid to substitute! Just because you don’t have an ingredient, don’t let it prevent you from making the dish. So, use veggies you already have in your fridge or whatever you like. 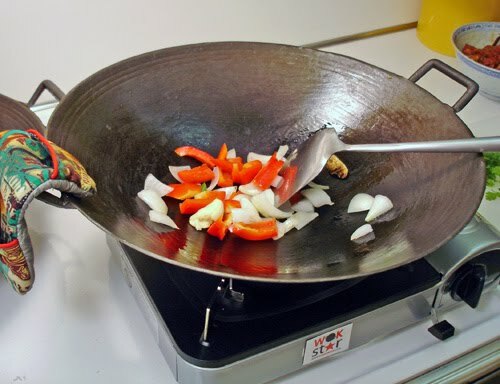 You don’t need 2 woks to do this. My husband calls it Stereo Wokery! Cooking Asian doesn’t mean you have to use just Asian veggies. 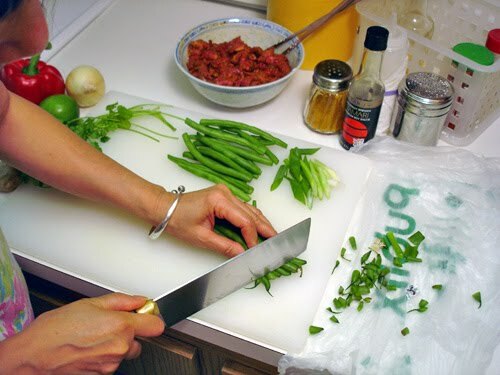 By adding a few Asian seasonings, you’ll give your dish an Asian twist. Is the word “Asian” used enough in one paragraph? ENJOY! !